Levania, a Gothic-Metal-oriented band, was born in Ferrara (Italy), on 25th March 2007 and later completed in April 2009. Original members are : Still (Keyboard and backing vocals),Raven (Guitar), Fade (Bass) and Gianz (Drums and percussions). Ligeia is the new frontwoman and lead vocals from January 2011. Their songs are based on several inspirations and influences: it’s not therefore a proper definition to label them as a pure “gothic metal” band. 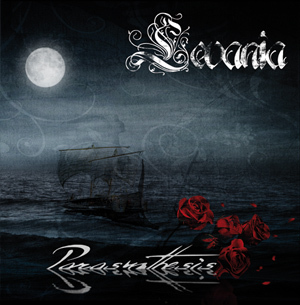 Perhaps Gothic-Epic-Death-Metal is a more appropriate definition for Levania music and composing style. Since the Scandinavian Death Metal imprinting is pretty evident in their songs, the result is a very gloomy and pathos-filled reminding of Moonspell atmosphere, as well tribal rhythms and dark sound. Such influences are blended together to form a new particular Gothic Metal wave born in the Mediterranean Sea and grown up with legends, stories and European myths.